The Takako Uno Marine Stock Photo Library image database is intended for commercial image buyers only. This site contains no royalty free images. All images are copyright protected with all rights reserved. Please contact us at saiwong@netvigator.com for any of the site's and other desired images in mind. Due to restricted usages of our commercial images, for students and non-profit organizations, please contact us regarding other terms and conditions. Takako Uno is a full time marine photojournalist and now based in Hong Kong. She has left bubbles in many places of the world, including her native country, Japan. 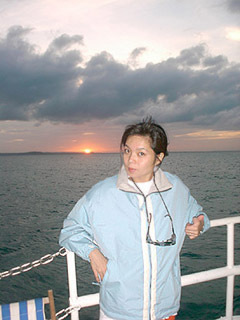 Co-author of marine coffee table books: “An Ocean Odyssey” & “Gorontalo Hidden Paradise”, Takako’s images have also appeared in dozens of books and photo exhibitions (incl. “BBC Wildlife Photographer of the Year” at Natural History Museum, “Ocean Views” at Smithsonian National Museum of Natural History & “Secret Lives of Seahorses” at Monterey Bay Aquarium). Her works have grazed over a hundred journals, including National Geographic, National Geographic Explorer, BBC Wildlife, Tauchen & Nature’s Best Photography. In addition to her 30-plus awards in international photo contests (incl. BBC Wildlife, Marine Photo Japan Grand Prix, Nature’s Best Photography), Takako has discovered 4 new species of Nudibranchs, with one being named as ‘Takako’s Trapania’ & another one as ‘Uno’s Trapania’. In Mar 2009, Takako has been inducted as member of the prestigious “Ocean Artists Society”, founded by Wyland, Talbot & Harvey. Takako Uno now journeys with husband and Hong Kong marine photojournalist, Stephen Wong (www.stephenwong.com), on locations making her own images and sometimes modeling for Stephen.